This demonstration steps through a series of screen captures that shows how Groups and Brackets simplifies reporting and display of soccer tournament results. It is based on a real tournament, but the scores are simulated to test and demonstrate the features. The "Rumble11" demonstration can be used to step through the activities. Reporting is authorized for all users in this demonstration. Start the Rumble11 demo in another window, and enter the scores used in the screen captures, or try your own results. 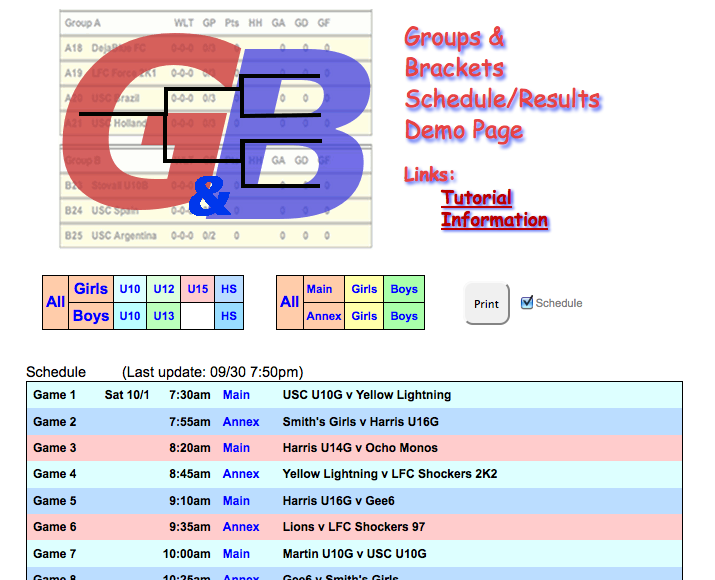 The home page of a tournament shows the header, the navigation bar, Print button, and the complete event schedule, showing all scheduled games. There are 54 games in this tournament and not all are shown.